Among the homes on display during Australia’s Sustainable House Day event was an old cottage in Victoria being retrofitted with hemp building materials. Bunjil Farm is a rural retreat set in the foothills of the Macedon Ranges, which is around an hour’s drive from the city of Melbourne and not far from the regional hub of Kyneton. 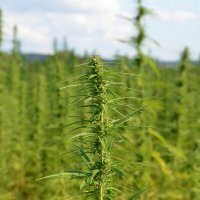 Industrial hemp has been researched, grown and processed on the farm since 2014. Some of that hemp is being put to use in a small 1890’s cottage on the farm. Four new hempcrete walls have been added to create a combined kitchen, dining and lounge room. Visitors to the house, which is still being renovated, were able to experience the acoustic and insulation properties of hemp and learn more about its myriad uses. Hempcrete is a very simple and very green product. It’s made by combining water, hemp hurd chips and a lime-based binder. As well as being a great insulator and sound-deadener, it also breathes; controlling humidity and inhibiting mould growth – all essential elements of a healthy building. Hempcrete is also incredibly resilient – it has preserved caves in India for more than 1,500 years. The owner of Bunjil Farm is Lyn Stephenson, who is also President of the Industrial Hemp Association of Victoria. Ms. Stephenson says while the licensed growing of industrial hemp has been possible in Victoria since 1998; the industry has barely grown. This is due in part to excessive regulation, but also as a result of only one significant processing facility in Australia, which is located in the Hunter Valley in New South Wales. Demand for hemp building materials exceeds demand in Australia and the cost of materials is high. To address this, Ms Stephenson says along with hemp processing hubs around the country, more farmers are also needed to be growing the taller varieties of the crop. Industrial hemp can be a very fast growing crop; attaining a height of 3 metres in 100 days; depending on conditions. Another benefit of growing hemp is that it fixes nitrogen and can improve poor soils. A single hectare of industrial hemp can produces between 10 – 15 tonnes of biomass.